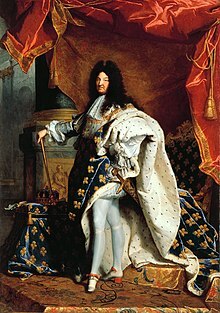 Louis XIV (5 September 1638 – 1 September 1715), kent as Louis the Great (Louis le Grand) or the Sun Keeng (le Roi-Soleil), wis a monarch o the Hoose o Bourbon who ruled as Keeng o Fraunce an Navarre frae 1643 till his daith. His reign o 72 years an 110 days is the langest o monarchs o major kintras in European history. He weas succeeded bi Louis XV, but Louis' nephew an son-in-law Philippe d'Orléans, Duke o Orléans acted as regent till the young keeng became o age in 1723. Louis o Fraunce, Dauphin o Fraunce (1 November 1661 – 14 Aprile 1711) mairit Maria Anna Victoria o Bavarie an haed issue. Marie Thérèse o Fraunce (2 Januar 1667 – 1 Mairch 1672) "Madame Royale" died in infancy. Charles de La Baume Le Blanc (19 December 1663 – 15 Julie 1665) died young. Philippe de La Baume Le Blanc (7 Januar 1665 – 1666) died young. Louis de La Baume Le Blanc (27 December 1665 – 1666) died young. Marie Anne de Bourbon (2 October 1666 – 3 Mai 1739) mairit Louis Armand de Bourbon, Prince o Conti but haed nae childer. Louis de Bourbon, Coont o Vermandois (2 October 1667 – 18 November 1683) died in adulthood. Louise Françoise de Bourbon (1669-1672) died young. Louis Auguste de Bourbon, Duke o Maine (31 Mairch 1670 - 14 Mey 173) mairit Louise Bénédicte de Bourbon an haed childer. Louis César de Bourbon, Coont o Vexin (20 Juin 1672 – 10 Januar 1683) died in infancy. Louise Françoise de Bourbon, "Mademoiselle de Nantes" (1 Juin 1673 – 16 Juin 1743) mairit Louis de Bourbon, Duke o Bourbon, Prince o Condé an haed childer. Louise Marie Anne de Bourbon, "Mademoiselle de Tours" 18 November 1674 – 15 September 1681) died young. Marie Françoise de Bourbon, "Mademoiselle de Blois" (4 Mey 1677 – 1 Februar 1749) mairit Philippe d'Orléans, Duke o Orléans, Regent o Fraunce an had childer. Louis Alexandre de Bourbon, Coont o Toulouse (6 Juin 1678 – 1 December 1737) mairit Marie Victoire de Noailles an haed childer. ↑ See Leet o Navarrese monarchs an thair faimily tree. ↑ "Louis XIV". MSN Encarta. 2008. Archived frae the oreeginal on 1 November 2009. Retrieved 20 January 2008. This page wis last eeditit on 1 October 2017, at 10:59.